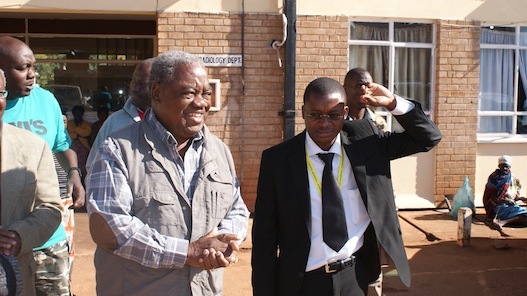 The Eastern Development Foundation (EDF) has banned Patriotic Front (PF) secretary general Wynter Kabimba from ever going to Eastern Province and has demanded the immediate resignation of all MMD MPs from the region serving as deputy Ministers in President Michael Sata’s regime. EDF chairman Kelvin Chulu has also demanded that President Sata should immediately remove Director Public of Prosecutions (DPP) Mutembo Nchito from prosecuting Mr Banda because the DPP had clearly shown that he was leading the prosecution to settle political scores. Mr Chulu said the people of Eastern Province were deeply upset with President Sata and the PF administration for its continued harassment and humiliation of Mr Bnada. Mr Chulo told the Daily Nation that his organization has constantly been calling on President Sata to remove Mr Nchito from prosecuting Mr Banda because it was clear that the former president would never get a fair trial with Mr Nchito as the DPP. He said the people of Eastern Province were aware that Mr Nchito and his colleagues were crooks holding President Sata hostage and were determined to politically nail Mr Banda purely for egotistic reasons based on vengeance, retribution and corrosive hatred against the former President. He said the people of Eastern Province will not relent in defending Mr Banda and that they will do everything to stop the lawlessness that was being exhibited by President Sata and those that were holding him hostage. He said the persecution of Mr Banda was evil that was openly being perpetrated by the wicked, heartless and selfish people in the name of Mr Nchito, Mr M’membe, Mr Kabimba and Speaker of the National Assembly Patrick Matibini. “The people of Eastern Province have therefore resolved to ban Mr Kabimba from ever crossing the Lungwa Bridge and enter Eastern Province. We are also demanding that all MPs from Eastern Province serving as deputy Ministers in Mr Sata’s regime to immediately resign and join hands with us in defending Mr Banda,” Mr Chulu said. Mr Chulu said the people of Eastern Province had carried out wide consultations from among other Zambians from other provinces over the persecution of Mr Banda and that the of the people of the region were of the solid view that there should be sanctions against Mr Nchito, Mr Kabimba and the entire leadership of the PF for perpetrating injustices against Mr Banda and other private citizens. He said the people of Eastern Province have since embarking on a crusade that would see the collection of signatures from Zambians across the country to petition President Sata to remove Mr Nchito from prosecuting Mr Banda. He said the PF has committed the highest form of illegality when they blocked Mr Banda from travelling to South Africa for his official international assignment. “The MPs from Eastern Province serving as deputy Ministers who will refuse to resign shall be considered traitors not only to Mr Banda but to all the people in the region. Mr Edgar Lungu, the Home Affairs Minister has been behaving like Walyamungu, the man who was causing terror to Ugandans when Idi Amini was President of Uganda,” Mr Chulu said.